This isn’t just any road…this 92 mile byway has been designated an “All American Road”, one of only 31 in the nation and the highest honor to be received by a scenic byway. It’s also the only highway in Washington that’s both an All American Road and Scenic Byway — which tells you just how gorgeous it is! Majestic Mount Rainier and Crystal Mountain dominate the landscape as this corridor traverses the prominent Cascade Range along the Chinook Byway, State Route 410. This journey is an exceptional traveler experience combining beauty, history and recreational opportunities into a complete travel destination of national significance. Chinook Scenic Byway is anchored by the lowlands of the fertile agricultural communities of Enumclaw on the west end and the arid town of Naches on the east side. Passing through the Wenatchee National Forest, the Mt. Baker-Snoqualmie National Forest and Mt. 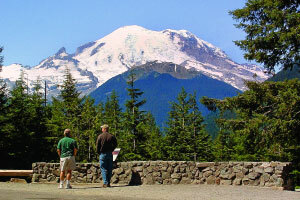 Rainier National Park, this diverse region is rich in recreational opportunities. Many trails lead from the lowland forests to alpine meadows and on to snow covered mountains. Outdoor activities are plentiful including hiking, climbing, snowshoeing, cycling, horseback riding, wildlife watching and others. In addition to the outstanding natural beauty and recreational possibilities, the byway also boasts historical importance. A 75 mile section of the corridor was named the Mather Memorial Parkway in 1931, in honor of Stephen Mather, the first director of the National Park Service. Additionally, The Historic Naches Trail cuts through the byway. This route used in the 1830’s between Steilacoom and Walla Walla by the Hudson Bay Company as well as Native Americans whose place names are found in locations throughout the region. For complete details on byway activities, attractions and opportunities, visit the Chinook Scenic Byway website.